Is it solid science that natural gas is better than coal, producing much less carbon pollution per unit of energy produced? You betcha! But it’s also solid science that solids behave differently than gases. At least there’s no greenhouse gas coming from coal before you burn it. 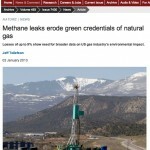 Natural gas, on the other hand, is greenhouse gas – and it leaks. Fracking is far too often portrayed, both by the media and by environmentalists, as primarily a problem of local environmental degradation. Of course, it is that, but it is also much more: in fact, one of the primary impediments to progress on the methane programs discussed at this website – seen as significant to holding climate change in check through the middle of the century in a robust and ever-growing body of research – has thus far been the exceptionally low price of natural gas created by fracking. Thus, the damage of fracking is not just the methane it releases itself, but other methane that it is making economically difficult to utilize. It is also generally slowing the shift to green energy, and thus, all told, fracking is one of the worst developments in the struggle against climate change. Fracking represents the largest increase in leakage rate per unit energy produced from natural gas, and while considerable controversy exists around how this accounting should be undertaken, the total estimated leakage rates from all factors – production, transport and consumption of gas – erase much, if not all, of the climate advantages of using natural gas over coal, even with the most gas-friendly accounting and industry-backed assumptions of leakage. It is particularly in the wider context of the various near-term climate risks presented at this site that the fracking controversy appears, if anything, to have understated the sheer folly of the move to natural gas. Since there is no question but that a shift to expressing more of a forcing as methane instead of CO2 replaces a long-term commitment to a future mild warming in favor of a shorter-term but more intense warming in the present, the advisability of such a shift depends upon the current state of the climate. If there were no near-term tipping points in the system, it might be a very good idea. Fundamental to the viewpoint of 1250, however, is that the current state of the climate is far more precarious than it might appear, because of Arctic tipping points. Shifting to natural gas right now for the sake of the climate is like buying the inverse of a credit card when you have no cash. As Climate Progress expressed, the impact of this article, with perhaps more scientific authority than any preceding it, is thermonuclear in the fracking debate, suggesting that leakage rates are even higher than suggested by Howarth and others. Indeed, if the 9% losses mentioned in the paper turn out to be indicative of industry practices, it would be hard to imagine that the hopes of some, that stringent regulation could make gas at least somewhat better than coal, are little more than a pipe dream, in that this is greater than 400% of the rates that some studies have suggested would be needed to make this a reality.